Access Hollywood has learned that Britney Spears and her brother were rescued by paparazzi on a Los Angeles freeway on Sunday evening. 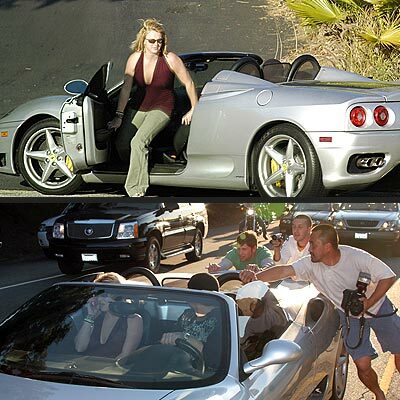 A source tells Access Hollywood that paparazzi, who had been trailing Spears on a Los Angeles freeway, helped the pop star and her brother Bryan push their broken down Ferrari to the side of the road. In a turn of events, the paparazzi then waited with Spears and her brother until authorities arrived. When they arrived, Britney and Bryan reportedly hopped into the squad car's backseat and were driven back home. It's about time they did something nice. Why didn't they call roadside assistance? I would think that Ferrari provides roadside assistance instead of calling the police. Anyway, this was nice of them to help out. Good to know they are not all jerks! !